You'll be providing the "horsepower" to move these mowers, and you're going to break a sweat. 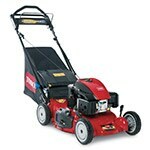 Self-propelled lawn mowers are very easy to operate and maneuver. You won't be supplying the power to move these mowers, you'll just be steering them. Self-propelled mowers work well on hills because you won't have to break your back powering them around your lawn. They work well on all types of terrain and are easy to maneuver around obstacles. Wide area lawn mowers are always self-propelled, so you'll be sure to have an easy time moving them. Many of them come with swivel wheel options to further improve maneuverability. The real benefit, however, is the significant increase in cutting width. Wide area decks are nearly two-thirds the size of a standard walk-behind mower. With two mower blades side-by-side, you can mow a lot more grass with each pass. Cutting widths range from 30 inches to 54 inches, and with options like mulching kits and bags you can finish with a professional look. Because you mow around things, some mowers come with front swivel wheels to help with maneuverability. Regular wheels may start to wobble over time due to constant turning. Eventually, the wheels can fall off. Swivel wheels not only improve maneuverability; they also keep the wheels on the mower. 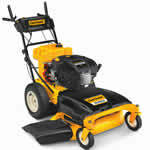 Gas-Powered Walk-Behind Buyer's Guide - Find Out How to Pick the Perfect Gas-Powered Lawn Mower. Our lawn mower how-to library can help you pick the perfect reel lawn mower, push lawn mower, riding lawn mower, zero turn lawn mower, lawn tool or lawn mower accessory.